After nearly a month of training and competition on Biscayne Bay, many of the top sailors competing in the 2019 Hempel World Cup Series Miami have seen just about every wind condition Miami has to offer. Αmerican favourites Stu McNay and Dave Hughes avoided any major pitfalls on the water and stand in third place, of 37 boats, after two races in the Men's 470. "We rolled a third and a fifth today," says McNay. "We did the big picture things right, but made a couple small errors. We did lose a couple of points. Dave and I have been sailing for a long time, we've raced in Miami for years. It's a challenging venue, so we're always glad when we walk away from a shifty day like this with scores we can carry forward." For Hughes, this regatta as close to a home event as he'll ever get, something he tries not to take for granted. "This is always a lovely event and always kind of the way to start the year for us," he says. "I live in Miami, so it's got a special meaning for that. It's a bit of an added stress because it is a home event and we are always looking to be proper hosts to everybody who comes here, off the water, at least. But it's wonderful because all of our international friends come to our home. It's a treat and for us this is just a staple of our sailing and our Olympic careers." 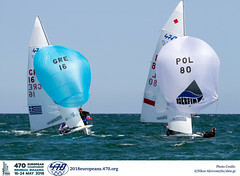 With a seventh at last summer's Hempel Sailing World Championships in Aarhus, Denmark, McNay and Hughes qualified for the United States for the berth in the Men's 470 class at the Tokyo 2020 regatta. Now they are focused on making sure they are the team to claim that berth. They've been down this road before, having sailed together in the Rio 2016 regatta - McNay sailed with a different partner in Beijing 2008 and London 2012 - but that doesn't make it easy. "We're trying not to be distracted, trying to keep our priorities in line," says McNay. "Not let one piece of equipment become distracting, not let one detail of a skill become distracting. Give our prioritization to each item, as it deserves, as it will help us most, which is a challenge because perspective is the easiest thing to lose when your head is this deep in something." 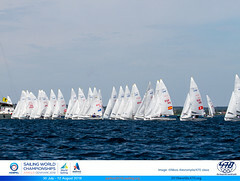 Anton Dahlberg and Fredrik Bergström (SWE) hold the early advantage in the Men's 470 on five points. They are two points clear of Italy's Giacomo Ferrari and Giulio Calabrò and a further point ahead of the Americans. The Italians took the first race win of the day and Japan's fifth placed team of Tetsuya Isozaki and Akira Takayanagi sealed the second. 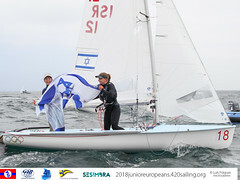 Among the fleets that got in two or more races, only the Women's 470 duo of Agnieszka Skrzypulec and Jolanta Zohar (POL) had a perfect day, winning both races. They trailed around just two of 12 marks and currently have a six-point lead over Fabienne Oster and Anastasiya Winkel (GER) and a nine-point advantage over Benedetta di Salle and Alessandra Dubbini (ITA). Racing resumes on Wednesday 30 January at 10:30 local time.